Raleigh, N.C. – Correctional officers working in North Carolina prisons receive a fourth consecutive salary increase of 4% in the 2018 state budget as lawmakers maintain a commitment to improve safety and staffing levels in the state prisons system. 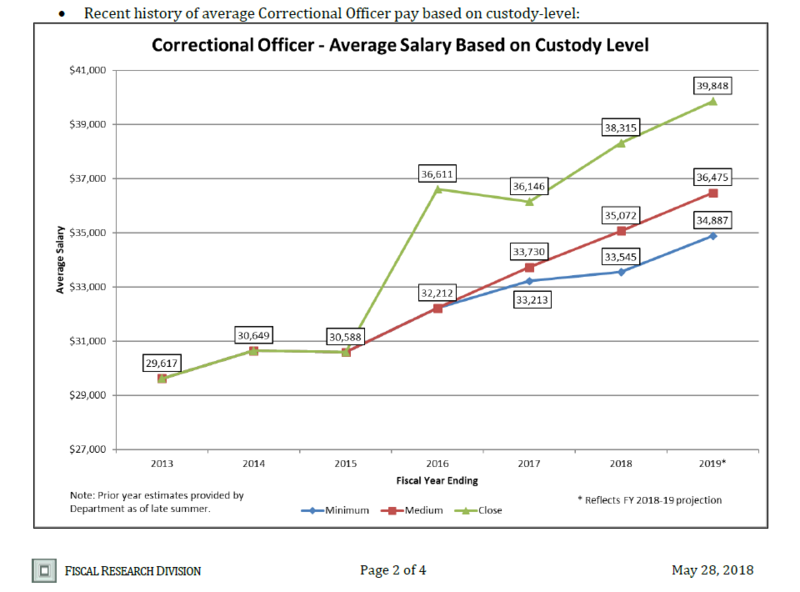 The average salary of a close custody (maximum security) correctional officer will increase over $9,000, from $30,588 in 2015 to $39,848 by 2019, according to the nonpartisan Fiscal Research Division at the state General Assembly. “We committed to substantially increasing compensation for correctional officers to accelerate hiring in hard-to-fill positions,” said House Speaker Tim Moore (R-Cleveland). The state will spend more than $700 million additional dollars on the correctional officer salary raises over the next decade. That figure rises to over $1 billion by 2032. The compensation increases aim to fill positions and improve safety in the state prisons system by focusing higher funding commitments to close custody positions that have higher percentages of vacancies. “If there is a tougher job in state government than being a corrections officer, I don’t know what it is, I really don’t,” Moore said during budget debate last week. The pay raises are a critical step the General Assembly has taken to increase staffing and security in state prisons. The state General Assembly also provided an additional $15 million for security equipment upgrades in the 2018 state budget to improve safety for prison personnel. In addition to compensation increases specific to the prison system, correctional officers also received the $1,000 raise for all state employees in 2014-15, the $750 bonus for state employees in 2015-16, the 1.5% salary increase for state employees in 2016-17 and the $1,000 raise for state employees in 2017-18. Five North Carolina prison employees were tragically attacked and killed by inmates in 2017 while serving on-duty. Sgt. Meggan Callahan of Bertie Correctional Institution was targeted and murdered by an inmate in April of last year. Four employees at Pasquotank Correctional Institution were killed during an escape attempt in October 2017. Eight others were injured. Geoffrey Howe, a maintenance mechanic, Veronica Darden, a Corrections Enterprises manager, and Correctional Officers Wendy Shannon and Justin Smith, died during the escape attempt at Pasquotank. State lawmakers vowed to maintain their commitment to improving prison staffing security in the wake of the attacks. The 2018 state budget also doubles the death benefit available to families of prison employees killed last year from $50,000 to $100,000, and retroactively expands the covered population to ensure they are eligible to receive its full value.